Subject: Antique print, titled: 'Mr. Aert van der Goes.' 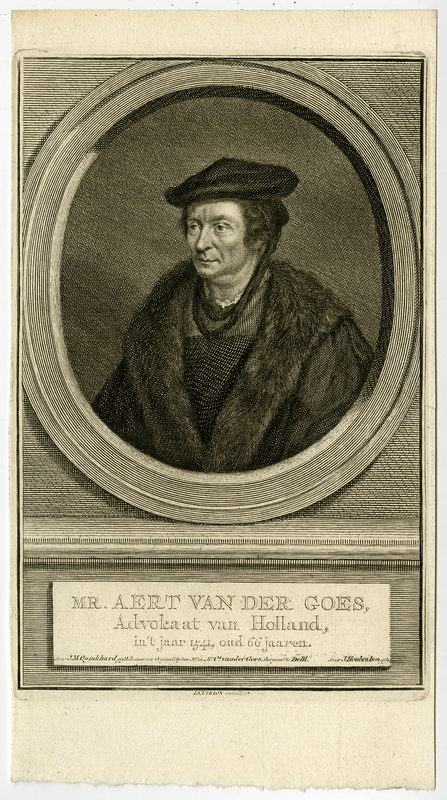 - This print shows the decorative engraved portrait of Aert van der Goes (1475-1545), a Dutch lawyer. Condition: Very good, given age. Margins cropped close to the image edge. General age-related toning and/or occasional minor defects from handling. Please study scan carefully. Medium: Etching/engraving on hand laid paper. Size (in cm): The overall size is ca. 11.7 x 21.4 cm. The image size is ca. 11.2 x 17.8 cm. Size (in inch): The overall size is ca. 4.6 x 8.4 inch. The image size is ca. 4.4 x 7 inch. Artists and Engravers: Made by 'Jacob Houbraken' after an anonymous artist. Jacob Houbraken (Dordrecht 1698 - Amsterdam 1780). Houbraken was a Dutch artist, engraver and art collector. Jacob spend most his time designing and engraving portraits, such as the one offered here. His father (Arnold Houbraken 1660-1719) before him was also a celebrated artist/engraver.